The site occupied by Buxton Community School is rich in history and one of the special features of this school is the array of quirky buildings and mixture of old and new. Comprehensive education came to Buxton in 1973 when Buxton College (the boys’ grammar school) and Kent’s Bank (the boys’ county secondary) became one – with the Buxton College site being the upper school and Kent’s Bank the lower. For the girls, Cavendish Girls’ School (grammar) and Silverlands Girls’ School (county secondary) combined to become Buxton Girls’ School, with Cavendish being the upper school and Silverlands the lower. The physical arrangements of this were very difficult with staff moving between the sites at different sides of the town – sometimes several times a day! In the 1980s, with further reform in the education system, thoughts and plans began to form for a single site, co-educational, school for the town of Buxton. Following lengthy consultations, architects began work in 1988. The site for the new school would be at the boys’ upper school Buxton College site. The original buildings would be encompassed as part of the new build which would include; a two-storey building stretching from east to west across the site, a new sports hall and impressive sports facilities including the laying of an all-weather pitch. This imposing new facility would become a mixed 11-18 school giving 1200 places for the 11-16 age range as well as 120 places for sixth form students. Building work began in the summer of 1989. Behind the scenes, the difficult process of staffing the new school from the existing boys’ and girls’ schools had to take place. The naming of the new school also had to be decided. After much consideration between staff, governors and parents, the two main contenders were Buxton School and Buxton Community School. In a very close vote Buxton Community School won out with the notion of community education and the school being an integral part of the community, tipping the balance. From September 1990 Buxton Community School began to take students with differing year groups being integrated over a three-year period, whilst building work and refurbishment to existing buildings was being completed. By September 1993 all students were being educated at the new site and in October that year, HRH Princess Alexandra officially opened Buxton Community School. In 2010 an impressive Engineering Centre was added to the site and was officially opened by The Duke of Devonshire on the 13th October. A 3G artificial all-weather grass pitch was a further addition in 2012 and this opened by Howard Webb MBE. 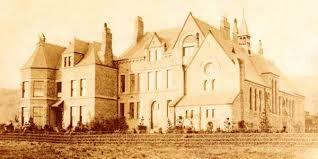 We are very lucky to have such a historically interesting buildings as part of our school premises.